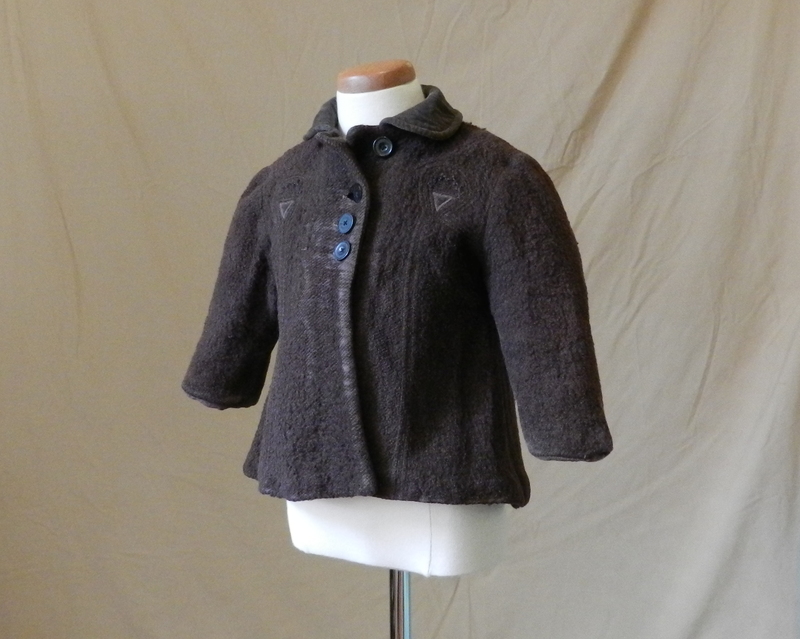 When I bought a lot of vintage/’Victorian’ clothing on eBay a few months ago, I wound up with this little guy. 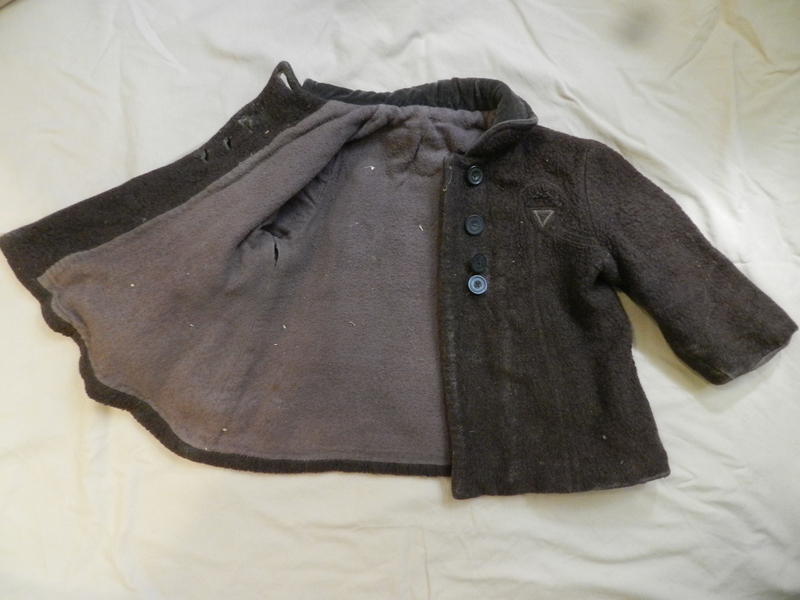 A very close to threadbare, looks/smells like it was stored in a mildewy garage for the last half century, baby coat. A great project to practice my conservation skilz, all of which I’ve gleaned off the internets. I decided that if I failed horribly, I wouldn’t be ruining somebody’s heirloom (I’d still feel bad though). I decided to wash the coat because it smelled less than fresh. It’s knitted wool and cotton, but I couldn’t think of a better way to clean it. I didn’t have any good soap that I trusted on old textiles, so I just used cool water. I figured that as long as I didn’t shrink it, I wouldn’t be doing damage, and removing some of the dirt would be beneficial. After a ten minute soak I got what looked like weak tea out of the coat. 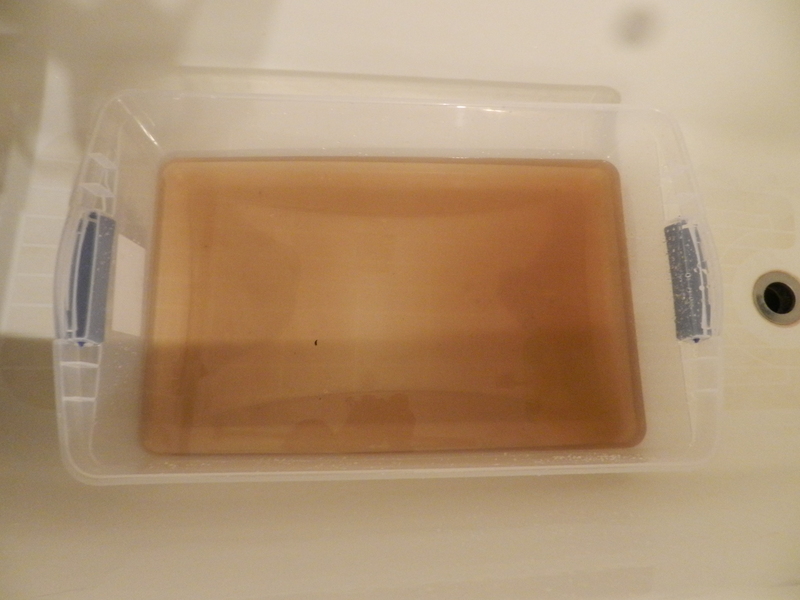 Three rinses later, I was still getting brown water, but a slightly different shade. When I looked closer, I realized that some of the pile was coming off the coat, so I stopped. To dry the coat, I made this cool setup out of a clean window screen and the flat tub. The coat lay on the screen which sat on top of the tub. I filled the tub with a thin layer of orange indicating desiccant beads, and set a fan to blow over the coat. I propped the coat open so air could circulate. It took over two days to dry the little guy, but it worked great. An you know what? It actually smells much better now. I didn’t think plain water would be so effective. To get the lint and bits of junk out of the pile, I used a new soft-bristle toothbrush. I didn’t want to pull any more pile out, so I used the toothbrush sparingly. So here’s the little kid, cleaned up! If the buttons look off-center to you, that’s because they are and your brain/eyes are not broken, congrats. After I cleaned the coat I found three cut button threads an inch to the left of the buttonholes, where a second row of false buttons once was. The coat would have appeared double-breasted originally. There’s also this, a cut tag near the left front corner. I’m figuring it’s a tag from a garment union, but there’s no way to tell since it was cut off. So what’s next for the little guy? I’m going to repair the place at the right cuff where the lining is falling out, and I’m going to freeze it for a month or so, to hopefully discourage anything living in it from living any longer. 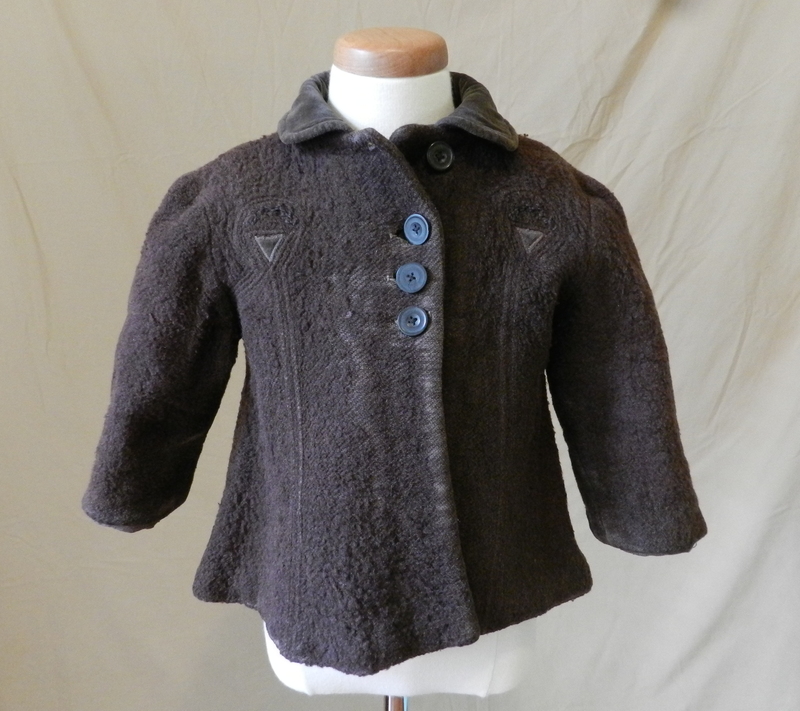 I’d love to add three buttons to the front, to kinda restore the original look, but I’m not sure if I have any similar buttons in my vintage button hoard. I’ll keep my eyes open. So what do you think? Personally, I really like the coat. 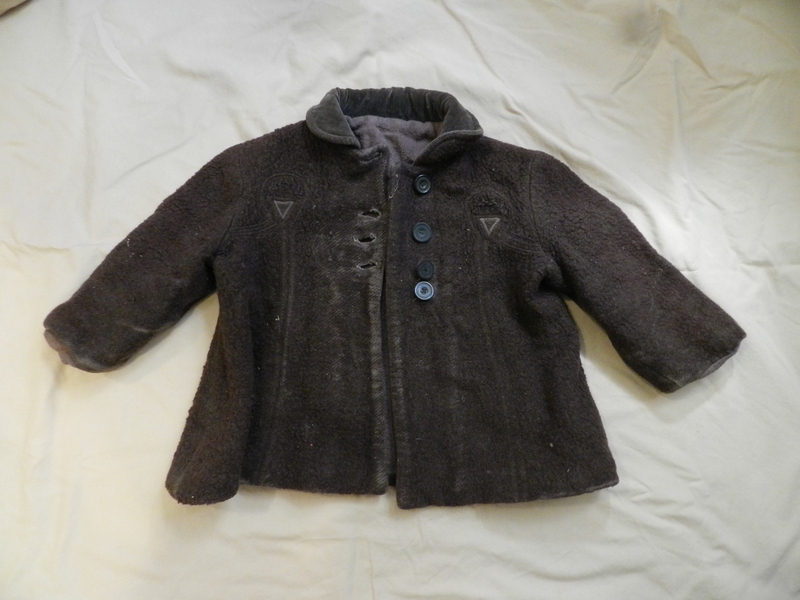 Somebody (I’m guessing a generation of somebodies, actually) wore this coat almost to death, then saved it for another 60-80 years because they liked it too. Or maybe because it was so grimy that they didn’t want to get close enough to it to throw it out. 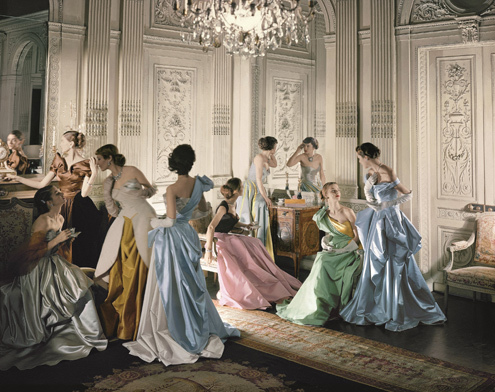 I’ve just found a few interviews with some of the talented folks who worked on the Charles James: Beyond Fashion exhibit currently at The Metropolitan Museum of Art. Enjoy! 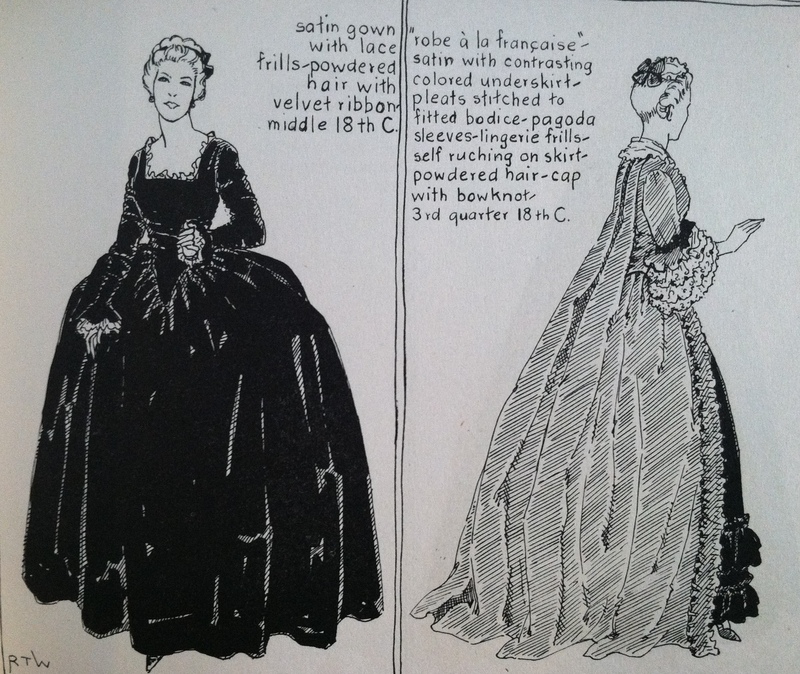 So where do we start on this black gown … neckline, sleeves, waistline, skirt cut … The francaise next to it is pretty much okay, though. Any book that uses Earle as a source, however, is going to be kinda-sorta okay in some places, and hideously awful in others. It’s one of those here’s-what-everybody-everywhere-wore-since-the-dawn-of-time books, and you can never expect these books to have enough detail to satisfy a moderate interest, or to have thorough enough research to build upon. I flipped from Egypt to 1800s Europe in a few minutes and didn’t see anything that really caught my attention – until I realized that the clothing in the book went right up to the date of publication. There’s no way the authors could have gotten their own clothing wrong. Just that line of cigarette smoke screams 1930s-1940s. Huzzah, authors! I mean, these are gorgeous. For fun (because I don’t know what the rest of society deems fun) I went back and read the forward. Yes, it’s a statement of the state of the fashion industry at an incredibly turbulent time. 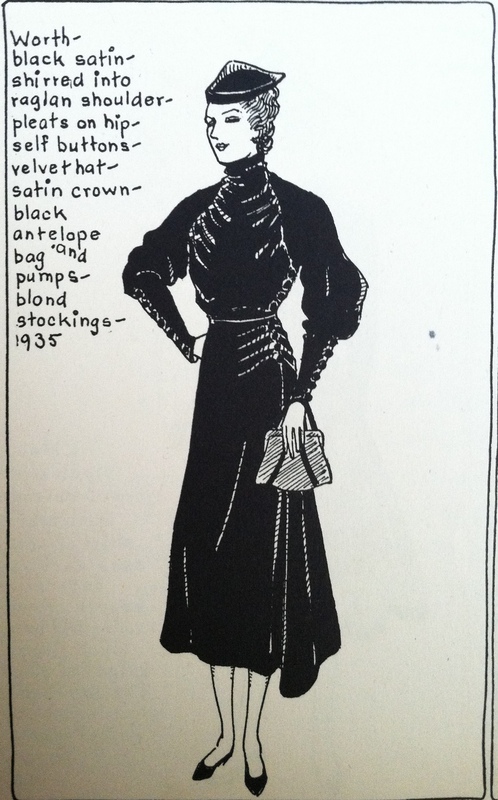 I’d always heard fashion professors say that 1930s fashions ‘fossilized’ through the 1940s until Dior’s New Look came in, but I never knew that people acknowledged this during the war. 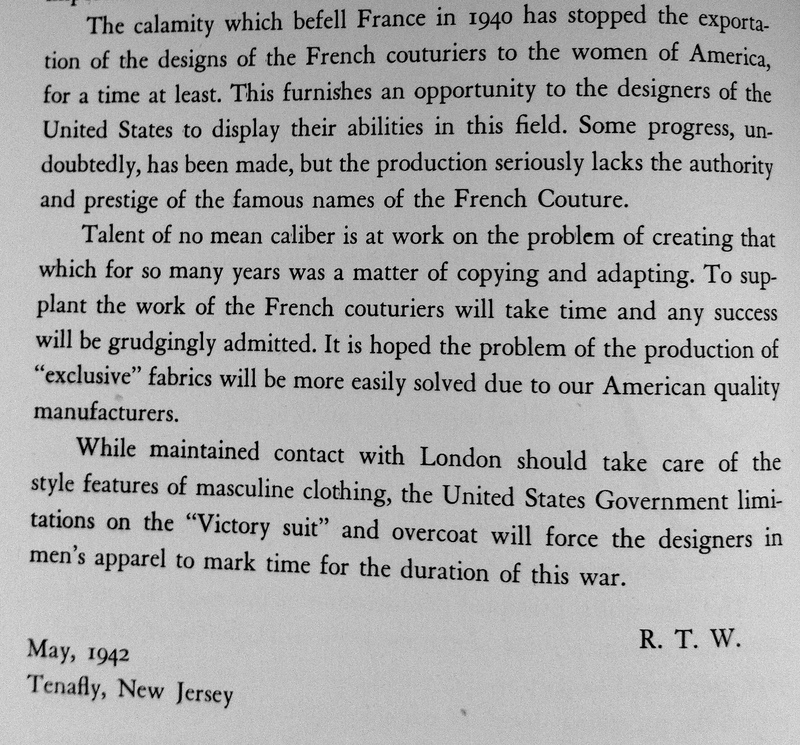 The forward also notes the opportunities American designers had during France’s occupation, without naming anybody. So do I like this book at all? Kind of. 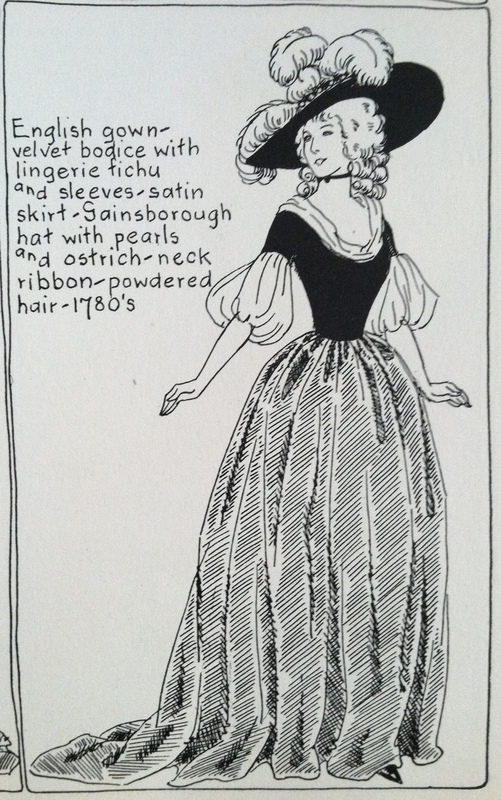 If you’re doing historical clothing research from before 1900, don’t you dare use this book. Really. 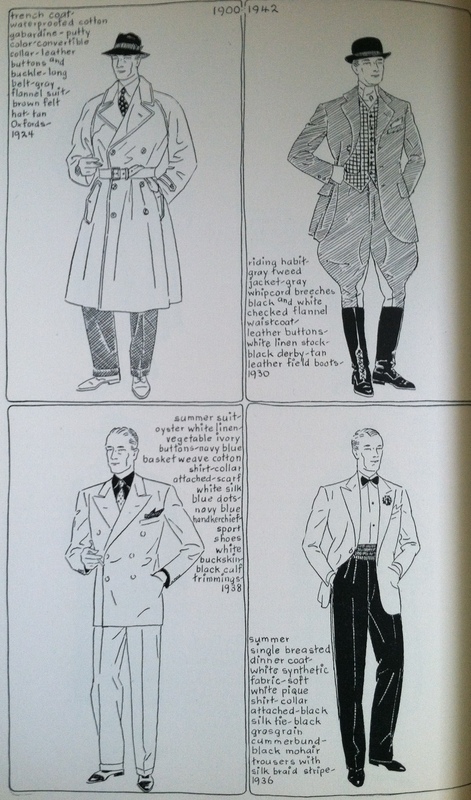 If you want an overview of 1910-1940 clothing in France and the USA, it’s a start. 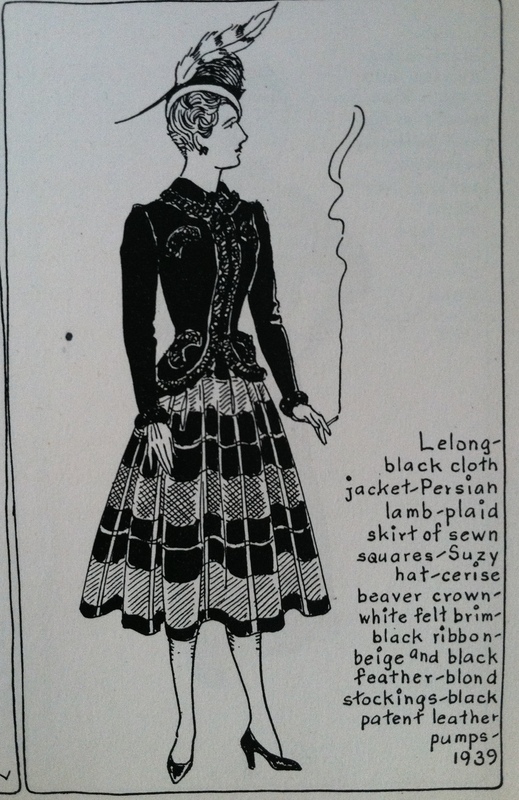 If you want to know what people thought of fashion history in the 1940s, and what inspired costuming, go for this one. For the history of fashion history, it’s pretty awesome. Recently I took a little time to visit the new Charles James: Beyond Fashion exhibit at The Metropolitan Museum of Art. I was both impressed and not impressed with the whole thing. I suppose after experiencing Alexander McQueen: Savage Beauty, Charles James is tame subject matter. So let me air the cons first. The exhibit is very unfortunately spread over a few small galleries in the museum, meaning one has to hike all the way from European or American statuary, through the Wrightsman Galleries, through the Medieval galleries, across the lobby and through the Egyptian wing to the Temple of Dendor, and finally down a flight of stairs to see the second half of the exhibit. Any atmosphere that the exhibit was meant to have is dissolved after having to follow vague signs and cryptic security guard’s instructions across the museum, elbowing through crowds as you go. This trek would be better with the help of a map, so FYI, if you go, grab one before you head into the Greek & Roman galleries (where the first exhibit begins). 1) So these ballgowns are really complex. The museum broke them down with computer animated videos showing how each was draped, cut and sewn. Some videos even show X-ray images of parts of the gowns. The brilliance of James’ design is in his drapery, and these animations and live camera feeds show exactly how awesome his work is. The entrance to the first gallery even has a handful of muslins on dress forms, so you can see the process of designing the gown. 2) Robotic arms with cameras at the ends move around the gowns, showing close-ups and angles that you might not see from where you stand. 3) The gowns are so well-lit, even for being in a darkened room, that you won’t miss a detail. Somebody did an awesome job with that. Most of the gowns are on their own slightly elevated platforms, and you can actually walk all the way around them. Others are on a larger platform, sometimes partially behind glass, but the design of the exhibit allows you to see from most angles, even if it means crossing the room. Hallelujah! No more security guards getting nervous when I bend over to see something a few inches closer. The brilliance of this exhibit is the way the gowns are presented, and the videos and camera feeds. The exhibit designers and curators certainly chose the perfect way to illustrate James’ genius, and they executed it perfectly. It’s the next best thing to actually holding the gown itself. Visitors get to see truly iconic designs, up close and personal. It’s not a complete experience, and it might have a bunch of frustration thrown in the middle of it as you try to find the next gallery (I had given up finding it when I found it; I was walking out when I saw the entrance), but the presentation of each item is magnificent. Work, volunteering, and sleep, basically – and an embarrassing number of hours went to playing Minecraft. Oh well, you’ve gotta have something to make those New Year’s resolutions about. I’ve also been putting more time into my collection, though nothing really monumental has been happening. I added a handful of 18th-19th century sleeve buttons and an awesome almost-complete 2nd century Roman fibula. The textile items that are in the collection already have been taking turns chilling in the freezer. Last week I spent a few hours taking better pictures of some of the items. 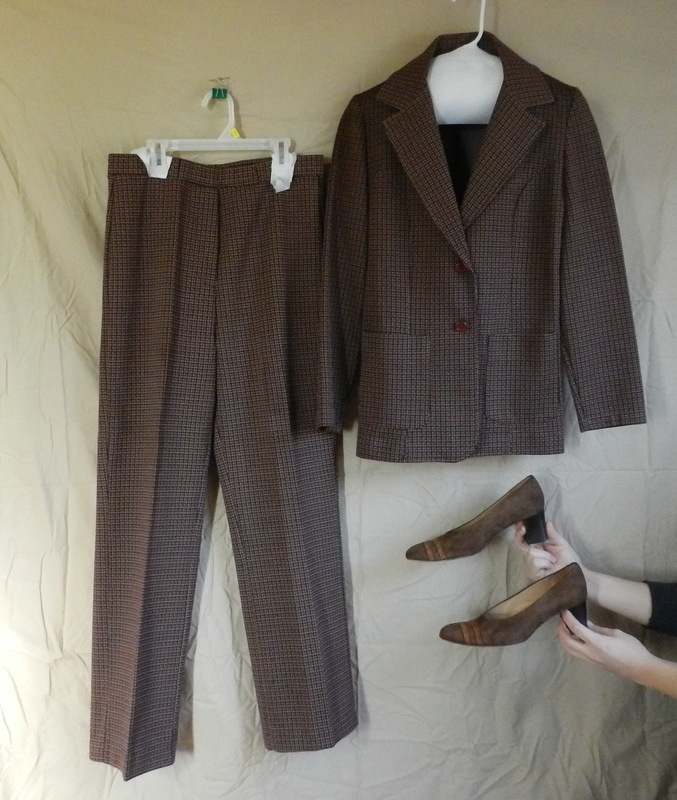 In honor of Anchorman 2, a woman’s burgundy pantsuit from the 1970s. Two pieces of double-knit polyester goodness. Shown with suede heeled loafers, 1970s. 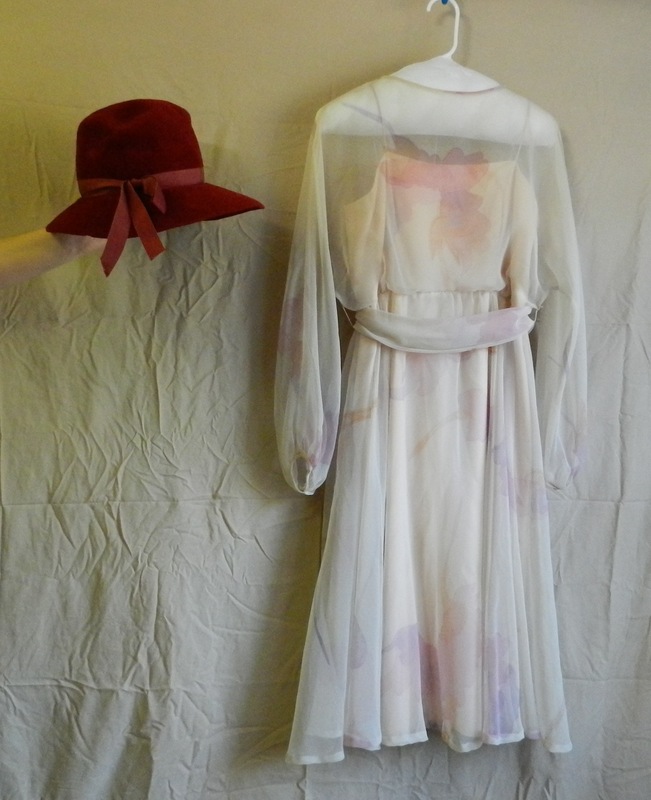 A Dan Lee Couture chiffon dress, 1970s, with the 1970s hat I wrote about in an earlier post. I also began to do some research on some pieces. I was doing well until I got to this tie. It’s wide – about 4″ – so I figured it was 1970s. I began to doubt that when I did research on the label, though. It was made and sold by the Coffman-Fisher Company Department Store, which operated from sometime in the 1920s until probably the 1960s or 70s; I can’t find more info. That made me wonder if the tie was older – say 1930s/40s, the other wide-tie era. The font used on the tie looks 1930s. Well, how to tell? I didn’t have the tie with me, but I had some rough measurements and an internet connection. Turns out that 1930s-40s ties were as wide as 1970s ties (4″ wide or so), but they were about 10″ shorter. 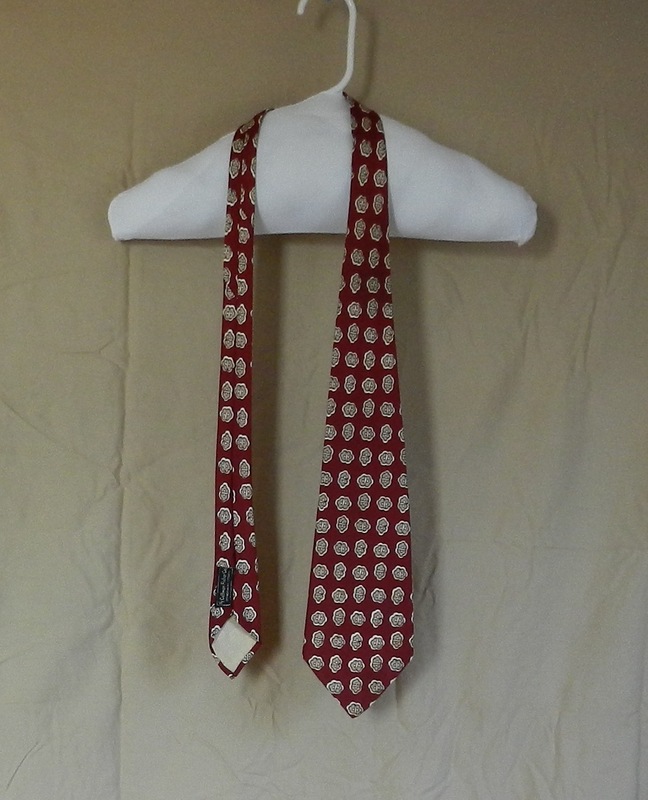 1970s ties are about as long as modern ones: 58-60″ long. So my tie, measuring about 4″ wide by 54″ long, is closer to 1930s-40s dimensions than 1970s, if my research is accurate.